Am I possessed by an Alien or not right now? Summary: When something goes majorly wrong on the Icarus spacecraft, rich heiress Lilac LaRoux and newly decorated General Tarver Merendsen, become trapped in a space pod. It’s only thanks to Lilac’s familiarity and mechanical skill that they get their pod to launch and narrowly evade death. After crash landing on a seemly empty, but terraformed planet, they begin their search for the ship and inhabitants of the planet. Strange visions accost the pair and they believe they’re going crazy, but maybe there’s something else on the planet with them. Something they can’t see, but can see them. I’ve had major cover lust since the first time I saw this book some time in 2014. 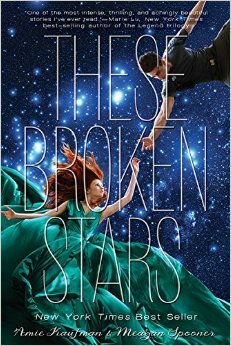 The cover is absolutely gorgeous, just look at her dress and the star background! Completely stunning, a great start in cover art for this trilogy and the others are also enchanting. I thought that the description was interesting and the cover is so beautiful, but it still took me ages to finally read this. I broke down after reading Illuminae (by Amie Kaufman & Jay Kristoff) and got myself an e-book version of this. For some reason, the e-book worked for me. I felt like I flew through this book, despite its many pages. The book is kind of slow in the middle portions when they’re exploring the planet, but something just kept pulling me back every night and I wanted to submerge myself in the world that was Lilac and Tarver. At some points, I honestly wanted nothing more than to smack Lilac, she was so self-entitled at points and there’s nothing that gets my blood rushing as being a selfish diva. As for Tarver, I thought he was a little harsh occasionally, but I could see that Lilac needed someone to push her to keep going and it also kept himself going. I’ve seen a lot of reviews that compare this to a space Titanic, but I can’t since I’ve never seen the whole Titanic movie. The romance between Lilac and Tarver struck me more with a Pride & Prejudice vibe. I enjoyed the romance for the most part, because I’m a real sucker for cute moments and anything like that. I also enjoyed the space aspect and I really hope it will be explored more in the sequel, I want to know everything about this world. I thought the authors did a good job at foreshadowing things that will most likely be unveiled in the rest of the trilogy, including why this ship crashed in the first place! Overall, this was definitely a good book. I’ve seen some very mixed reviews so I don’t want to oversell this, but I think you should definitely try the preview and see if this book is for you! I’d recommend this to fans of Star Trek and Sci-fi, as well as people who liked the Pride & Prejudice love story.